Like many other great filmmakers, James Cameron got his start with Roger Corman, who's known for fostering talent. His theatrical feature film debut is strangely enough, Piranha II: The Spawning. It's a sequel to Joe Dante's (who also came out of Corman's New World Pictures) campy, yet socio-political killer fish flick, Piranha. I'm not surprised that Cameron began his directorial career with a film made on, near, and partially underwater, but I was surprised to learn that there are two other directors (uncredited) listed over on IMDb. Trica O'Neil (who went on to have a healthy TV career and play "Woman" in Titanic) stars alongside the great Lance Henriksen (Cameron's Aliens and Terminator) as an estranged couple with a teenage boy living and working in Jamaica. He's a cop, she's a diving instructor at a resort. They clash. 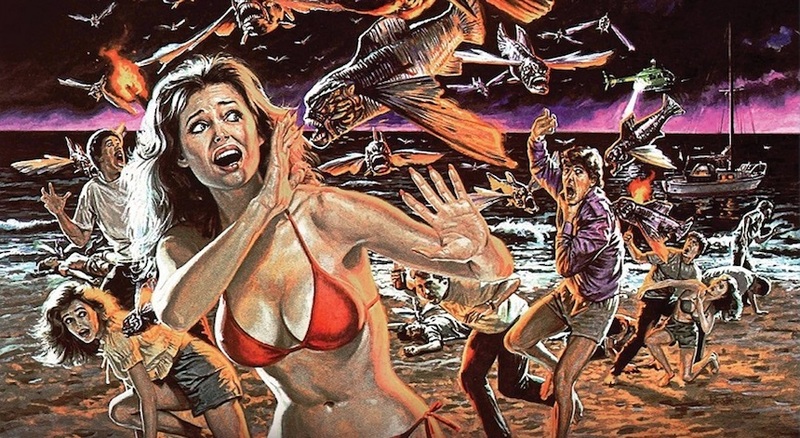 Hotel guests go swimming or hang on the beach and get eaten by piranha; only this time, they've got wings! Basically, this movie looks and sounds fine, but it isn't good. There are stories out there that Cameron broke into the editing room and cut his own version of the film, which is rumored to have come out on laser disc, once upon a time. I don't know if that version will ever see the light of day again, if that's true, which is a shame. The film pretty much exists to capitalize on the success of the original and I'd like to guess --- an excuse to film in the Caribbean. If you'd like to know more about Piranha II: The Spawning, check out the trailer below or head over to Shout Factory's site, where you can preorder (out on July 31 here in North America) the Blu-ray here.